Hello everyone, please go to SeymourRealEstate.ca for my Latest Listing! 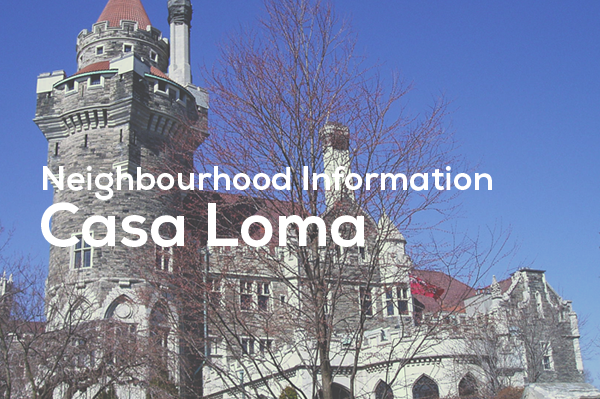 The Casa Loma neighbourhood, named after the historic castle that serves as its striking centrepoint, is one of Toronto’s most beautiful districts. Casa Loma is located just south of Forest Hill, one of the wealthiest neighbourhoods in Toronto, west of South Hill and just north of the trendy and popular Annex. Its northern boundary extends along St. Clair Avenue West, and its eastern perimeter runs along Spadina Road to the CP railway tracks just north of Dupont Street, reaching its western edge at Bathurst Street. Despite its central location, Casa Loma is a serene and quiet respite from the hustle and bustle of the city and is filled with mature trees, expansive green spaces and scenic ravines. Casa Loma’s storied history begins with Sir Henry Pellatt, an extraordinary successful businessman whose founding of the Toronto Electric Light Company and shrewd investments in the Canadian Pacific Railroad and the North-West Land Company made him a very wealthy man. In 1911, Pellatt finally acted on his long-standing dream to build a European-inspired castle as his family home, and he hired the renowned architect E.J. Lennox to help him turn his vision into a reality. The castle would be called Casa Loma, named after the tract of land on which it was to be built. The construction of Casa Loma took three years to complete and came with a price tag of $3.5 million, which was a staggering sum of money in the early 20th century. However, the finished product was (and still is) one of the most unique and accomplished pieces of architecture in Canada. Fortified with towering bulwarks and creative interior details including ornate suites and secret passageways, Casa Loma was widely considered the most luxurious and beautiful private residence in North America at the time of its completion. Pellatt completed its elegance by filling the interior with treasured artistic masterpieces by both Canadian and international artists. However, Pellatt’s fortunes would soon take a sharp turn for the worse. New legislation ended his monopoly on electricity, and Pellatt’s debts continued to mount as he tried in vain to invest in the expansion of his extensive business holdings. Pellatt believed that Toronto’s burgeoning urban growth would help him rebuild his fortune, and he set out to develop the land around Casa Loma into an exclusive upper-class neighbourhood. However, the breakout of the First World War disrupted his plans, and though time would eventually prove Pellatt correct in his belief that Casa Loma would evolve into an affluent neighbourhood, it was too late. In 1924, Pellatt was forced to sell off his most valuable possessions, abandon Casa Loma, and retire to a modest farm in King Township. William Sparling, a successful architect, then proposed the renovation of Casa Loma into an upscale hotel. Though Sparling’s plan initially met with success, helping Casa Loma become a Toronto nightlife hotspot during the “Roaring Twenties,” the castle once again lapsed into vacancy when the Great Depression struck. By that time, however, several subdivisions had sprung up around Casa Loma, including Austin Terrace, Poplar Plains, Russell Hill and Warren Road. Today, these streets are still home to some of the most sought-after luxury residences in the city. In the late 1920s, Glen Gray and the Casa Loma Orchestra took up an eight-month residency in the castle after it had been converted to a nightlife attraction. When their Casa Loma stint ended, the orchestra proceeded to take a North America-wide tour, and became one of the best-known “big bands” of the jazz age. Over the years, Casa Loma and its recently renovated stables just north of the castle have been used as film locations in dozens of movies and television shows, including X-Men, Chicago, Scott Pilgrim vs. the World, Being Erica and many others. It was also made over in the guise of the Hogwarts School of Witchcraft and Wizardry to coincide with the publication of Harry Potter and the Deathly Hallows, the final book in J.K. Rowling’s seminal fantasy series. The majority of Casa Loma homes are detached houses, built in the Edwardian, Tudor, English Cottage and Georgian styles which were highly fashionable among the well-to-do when the neighbourhood was being developed into subdivisions. Architectural features of these styles include ornate and refined exterior brickwork, gabled or gambrel roofs, embellished cornices with etched dentils, mullioned windows, and close attention to intricate accentuating details, both inside and outside the house. 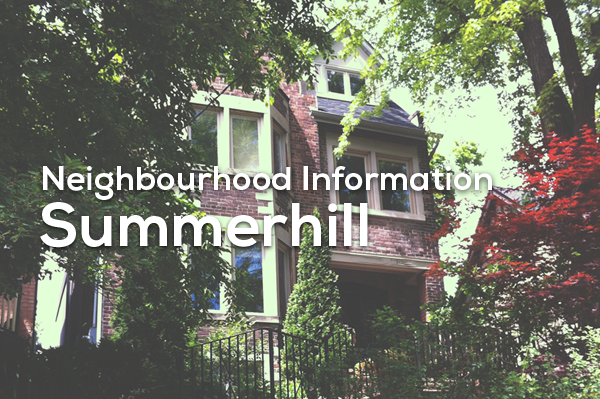 In recent years, condominium developments have also begun to spring up in the neighbourhood, primarily along Davenport Road, Spadina Road and St. Clair Avenue West. With striking views of the winding ravines that wind through the neighbourhood and fast, convenient TTC access, these condos are proving highly popular, especially with younger and first-time home buyers. Casa Loma is served by two TTC subway stations: St. Clair West and Dupont, both of which are on the Yonge-University-Spadina line. Bathurst Street is also well-serviced by buses, while streetcars run along St. Clair Avenue West in both directions. It takes about 20 minutes to drive downtown in regular traffic conditions. The best north-south arterial roads are Avenue Road/Bay Street, Bathurst Street, Spadina and Yonge Street. Allan Road connects to Highway 401 and is approximately six kilometres from the Casa Loma castle. 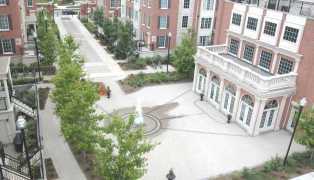 One of the most attractive features of the Casa Loma neighbourhood is its calm, quiet and expansive outdoor spaces. Wychwood Barns, originally a TTC streetcar storage facility, located in Hillcrest just south of St. Clair Avenue, features a converted heritage site which now serves as a community centre, with extensive parklands, a greenhouse, art studios and a farmer’s market. Sir Winston Churchill Park, situated at the southeast corner of St. Clair Avenue and Spadina Road, is one of Toronto’s premier neighbourhood parks, with a large children’s play area and an extensive network of hiking and running trails. It also houses the popular Sir Winston Churchill Tennis Club which has 10 well-lit courts. 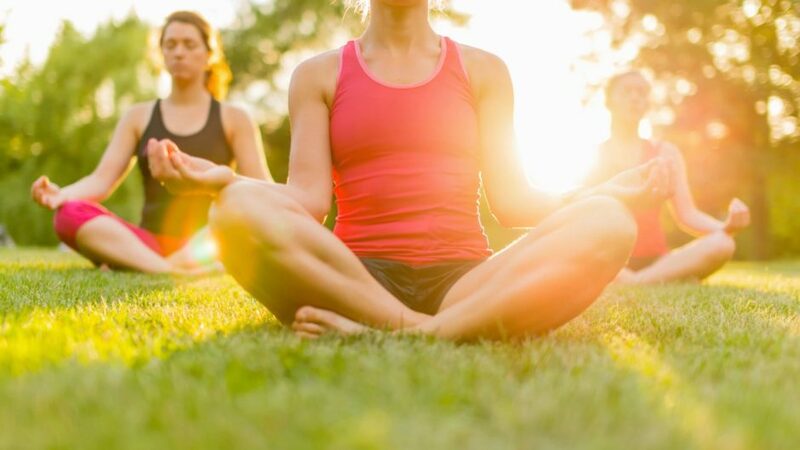 Sir Winston Churchill Park also connects to the adjacent Nordheimer Ravine, a serene respite in the centre of Canada’s largest city, with excellent paths, picnic and leisure spots, and a wide assortment of flora and fauna. In addition to Casa Loma, which is now one of Toronto’s most popular attractions with guided walks and tours throughout the year, the Tarragon Theatre is one of the neighbourhood’s best-known cultural landmarks. The Tarragon welcomes both classical and contemporary productions on its stage, and is one of the Toronto Spring Arts Festival’s key venues. Casa Loma also has a vibrant arts scene, with several renowned galleries and exhibition spaces including Graphis, Laluque Atelier, Studio 8 Graphics, the Toronto Free Gallery and Van der Veen Geert Fine Art all within close proximity. Spadina Museum House and Gardens, located at 285 Spadina Road, is another historic architectural landmark which often gets overlooked in the shadow of the more ornate Casa Loma. However, Spadina House, which was built in 1866, offers wonders all its own. During the warm-weather months, visitors can wander its breathtakingly landscaped gardens, which offer endless photo opportunities. Casa Loma is serviced by the Wychwood Branch of the Toronto Public Library. Located at 1431 Bathurst Street, the library offers an extensive collection of print, A/V and digital materials as well as ongoing educational and cultural programs for people of all ages. The Spadina Road Library (10 Spadina Road) and the City of Toronto Archives (255 Spadina Road) are also located close to Casa Loma. Parents should note that admissions procedures and policies are set by individual institutions, and may be limited to students residing within specific geographic boundaries. Contact any private schools you’re interested in prior to completing your purchase of Casa Loma real estate. Given Toronto’s strong multiculturalism, it’s no surprise that a wide range of ethnic eateries can be found alongside Casa Loma’s traditional alternatives like gastro pubs and casual dining restaurants. Italian, Indian, Japanese, Chinese, and Mediterranean options are within the neighbourhood. For shopping, many residents migrate south to Bloor Street in the trendy Annex neighbourhood, where specialty clothing boutiques, jewellers, and department stores offer the finest upscale consumer goods the world has to offer. Casa Loma also has a high concentration of organic restaurants and greengrocers, and it is home to a large Loblaw’s outlet located near the St. Clair West TTC station, which houses one of the first Joe Fresh flagship stores to appear in the city. Wychwood Barns also offers a weekend farmers market is very family friendly. Casa Loma has been one of Toronto’s preferred upscale neighbourhoods for decades, a trend which has continued strong in the 21st century. Casa Loma real estate generally appreciates at robust rates, providing area homeowners with security and excellent average returns on investment. Jethro Seymour is one of the Leading Toronto Real Estate Brokers. Jethro Seymour is a midtown Toronto residential specialist with over 20 years of sales experience in real estate, marketing, construction, and publishing. He has helped many families find homes in Toronto’s great neighbourhoods, and has extensive knowledge of local markets, new home construction, resale home sales, and the condo market. Living in midtown Toronto, Jethro previews many of the homes that come to market for his clients and inventory knowledge. Jethro specializes in the Midtown, Davisville Village, and Leaside neighbourhoods. “As a first time home buyer I had no knowledge of how to go about this process so I put my trust in Jethro. After telling Jethro our preferences for a home he showed us a variety of places and allowed us to make our own decisions while providing helpful advice that spoke specifically to our needs. Jethro remained determined to finding us our perfect home and never lost patience, working with us while we took our time realizing our specific requirements. He always greeted us with a smiling..."